The Hawke Sapphire ED 8x42mm binocular, HA3767 (green), is not the most expensive binocular I own, much less that I've evaluated over the years. Nevertheless, it is a decidedly upscale binocular and my eyes could not tell the difference between this binocular and a $2000 model. They are shipped nicely packaged in a hard leather case. Compared to standard binoculars, the Sapphire ED improves upon image brightness, contrast and color fidelity though the use of extra-low dispersion (ED) glass, combined with an advanced dielectric prism coating. On the strength side, they have stronger and costlier magnesium alloy frames, as compared to the usual aluminum alloy. 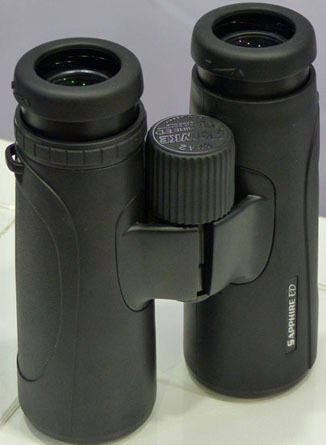 The set of binoculars that I used the most in the field in 2013 was the Hawke Endurance #HA3944 8x42mm roof prism binocular. At a very appealing $210 or so discount retail price, they are remarkably good with fully multi-coated lenses and phase corrected BAK4 prisms. However, the Sapphires are clearly a cut-above with ED glass, dielectric coating, better lens caps, water-repellent objective lens coating and a magnesium chassis. You don't have to spend big bucks to own an outstanding binocular. The Hawke Sapphire ED binocular, at about $420 discount retail price, ranks as the most for the least I have reviewed in an upscale field binocular.